This strawberry shortcake dessert recipe is about to become your favorite, because it’s the easiest strawberry shortcake for a crowd you’ll ever make. This one is perfect for getting you in the springtime mood: Strawberry Shortcake Dessert Lush. It’s got layers of pudding, whipped cream, and strawberries. Just hand me a fork. Kindle Unlimited. I originally thought paying $10 a month for books was ridiculous. But if you read as much as I do, it pays for itself. Chick-lit Murder Mysteries. I’ve been reading at least one a week through Kindle Unlimited. My most recent favorite: Sleep Tight by Rachel Abbott. And one last thing I’m obsessed with right now? 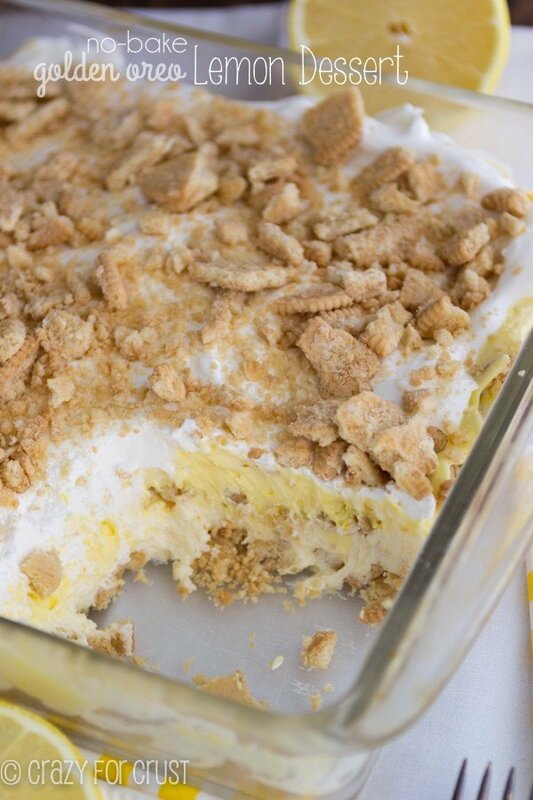 No-bake layered desserts. Mud Pie, Mint, Pumpkin, Lemon…I’ve made a ton of them over the past year. I like to call them lush desserts. Or I like to call myself a lush, because I can’t stop eating them. Another way these desserts really are like lush? You can’t stop at just one piece. Literally. They go down easy and don’t take up too much room so you have and other slice. Then another. And another until you’re dumping the pan out in the garbage just so you won’t eat the whole thing. *cough* That may or may not have actually happened. This strawberry shortcake version of no-bake dessert is one of my favorites yet. Vanilla pudding, whipped topping, Golden Oreos, and strawberries. Lots and lots of fresh berries! There are SO many names for this dessert. Most commonly, I see it called a No Bake Lush but also a No Bake Layered Dessert, Heavenly Dessert, Dream Dessert, or Strawberry Lasagna. I never ever know what to call it to get it to show up in search…so I usually just throw some names at a wall and hope for the best. Some sort of pudding filling (I’ve often seen Strawberry Cheesecake Dessert come up when I’m searching). Lots of fillings, like crushed cookies or fresh berries. In this dessert, I used Golden Oreos and Strawberries. HEAVEN! A No Bake Strawberry Shortcake Dessert is the easiest layered lush dessert recipe ever and perfect for summer. It’s a strawberry Oreo dessert filled with pudding and whipped cream! 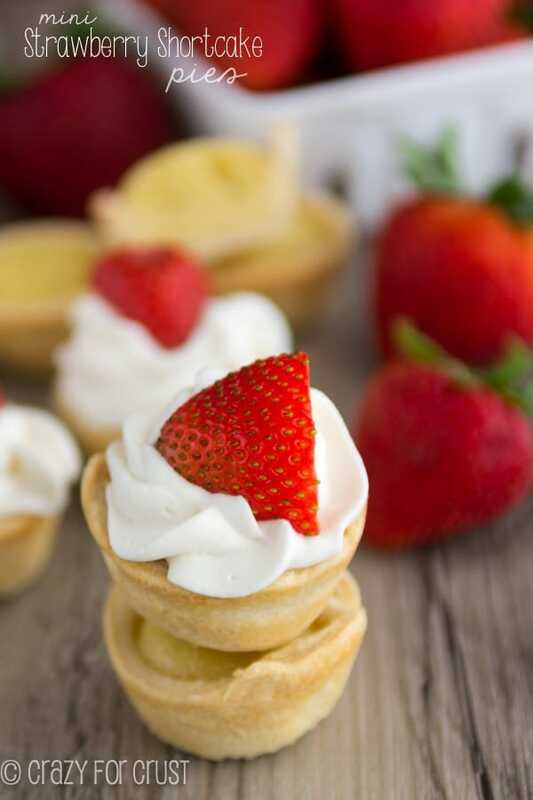 Just pin this strawberry shortcake dessert recipe for strawberry season. You’ll be happy you did. Here in California, it’s always strawberry season, which is a good thing. Jordan likes approximately 3 fruits: strawberries, raspberries, and apples. Luckily I can find all three year round. I don’t know what she’d do if we lived in, say, Nebraska? Or somewhere that doesn’t get good produce year round. She’d probably get scurvy. 1. It’s got fruit. That means you can eat it for breakfast. Okay. So maybe not those two things. But we can pretend. The shortcake comes from crushed Golden Oreos. Shortbread would also be amazing. Crush the cookies and line the pan with them. Mix up some instant vanilla pudding. You could use sugar-free if you want, or use lemon or cheesecake flavor. Fold in some whipped topping. Layer that mixture with a pound of fresh strawberries. Then top the whole thing with more whipped topping and more crushed cookies. This dessert is the perfect spring or summer recipe. Easter, Mother’s Day, 4th of July, summer potlucks, a random Tuesday. You pick. Just bring me a fork. 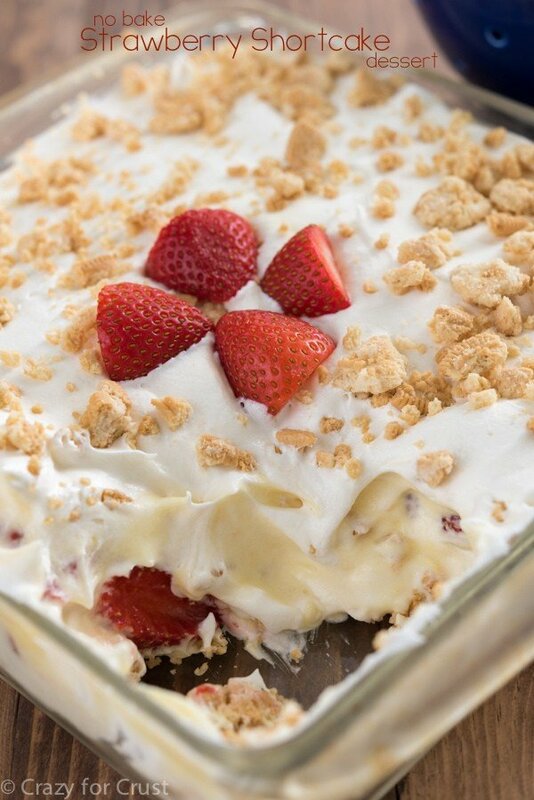 A layered lush no-bake dessert filled with cream and strawberries! 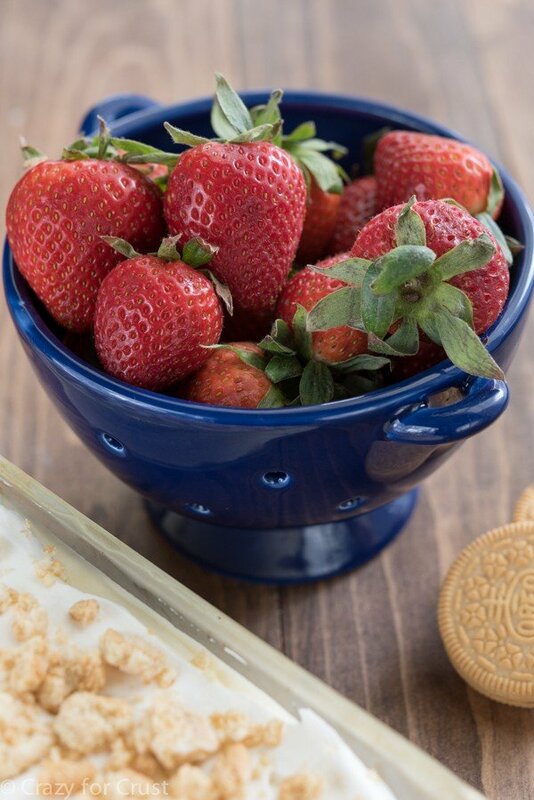 The perfect dessert for summer...or to get you in the mood for strawberry season! Whisk pudding, milk, and vanilla in a medium sized bowl. Let it sit while you prepare the crust. Crush the cookies in a large gallon sized ziploc bag using a rolling pin. Reserve 1/2 cup of the cookie crumbs. Place the 2 tablespoons melted butter in the bag and press with your hands to work the butter through the remaining cookie crumbs. Pour crumbs into a 9” square baking dish. The crust won’t be solid, it’ll stay crumbly. Fold 8 ounces of the whipped topping into the pudding. Place half the pudding mixture on top of the crust. 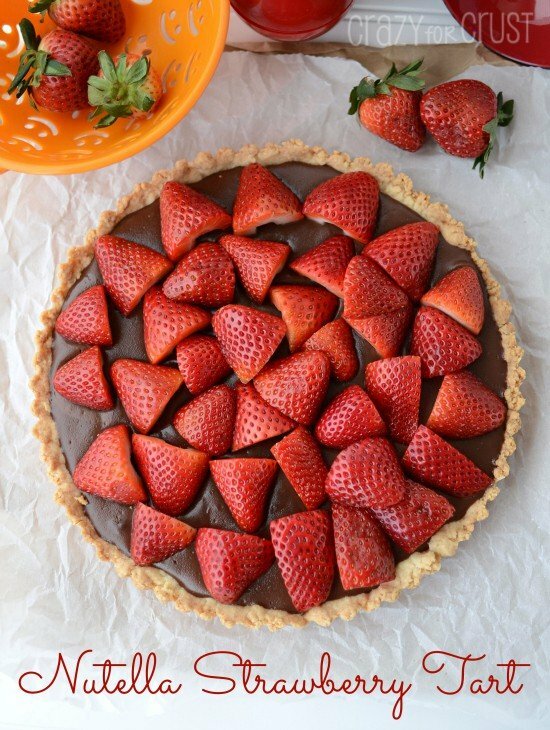 Place the strawberries in a single layer over the pudding. Spread remaining pudding mix over the top of the berries. Top with more whipped topping and sprinkle the remaining cookies over the top. Chill for at least 4 hours before serving. 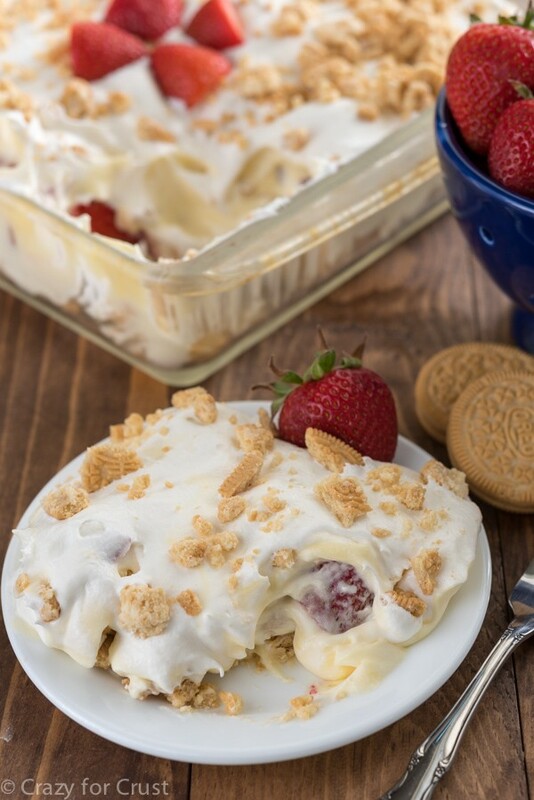 If you love strawberry shortcake and no bake desserts like I do, be sure and check out these: No Bake Strawberry Cheesecake by Inside BruCrew Life, No Bake Strawberry Eclair Cake by Shugary Sweets, or No Bake Strawberry Shortcake Icebox Cake by The Slow Roasted Italian. I want to make this, but was wondering if I could use fresh blueberries with vanilla pudding instead of strawberries?